Watching Story Massage in action is the best way to grasp the concept of combining storytelling with positive touch for children. So that’s exactly why we’ve produced a Story Massage DVD with demonstrations of 12 different Story Massages taken from our Story Massage book. We’re inviting you to take a look behind the scenes to meet some of the people involved and discover the stories chosen for the Story Massage DVD. Favourite rhymes and songs such as Twinkle, Twinkle, Little Star and Humpty Dumpty can easily be created as a short story massage, ideal for a younger person. 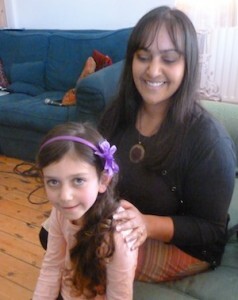 The DVD features Shirley Gain and her daughter, Esther (below) who had great fun sharing these familiar tales and other story massages. We loved the way that Esther always gave Shirley a big hug at the end of each massage! One of the many benefits of Story Massage is stimulating a child’s imagination – and so we’ve included several Story Massage ideas written to encourage children to enter a whole new world. Among the stories they demonstrate on the DVD, Victoria Stevens and her son, Oliver, became pirates on the high seas as they shared Ahoy There! Celebrating the changing seasons with Story Massage can add an extra dimension to the anticipation and experience of the event. And when Olly Pearson (below) decided to massage his mother, Bev, he chose Pancake Song. Olly became so involved in the story that, even as onlookers, we could almost taste the squeezed lemon and sprinkled sugar! Everyone loves to feel special – and Story Massage can be personalised so names of an individual child or group of children become the central characters in the story. Two sisters, Phoebe and Amelia Holt, demonstrated two massage stories including Let’s Bake a Birthday Cake which ended with a joyful Happy Birthday Phoebe! 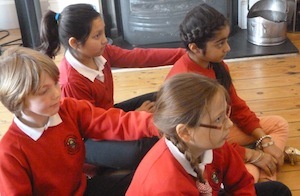 Children at Hertford Junior School in Brighton have the wonderful opportunity to share peer massage in school on a regular basis. 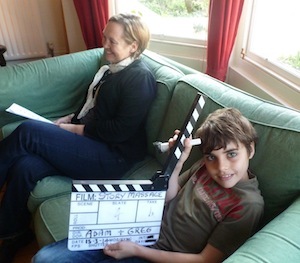 And so when their teacher, Helen (below), told them about the DVD filming day there was no shortage of willing volunteers. 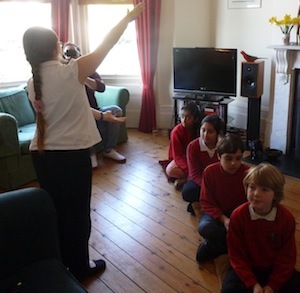 The children who were able to join us – Otis, Isabella, Aelfie, Eivina and Nila – demonstrated two massage stories Walking on the Moon and Great Fire of London written to help explore topics on the National Curriculum in a different way. We were delighted that all the children behaved so beautifully. They did not need reminding to ask permission before touching another child, and showed their appreciation at the end. We really couldn’t have asked for a more enthusiastic group of children (and parents and teacher, of course). 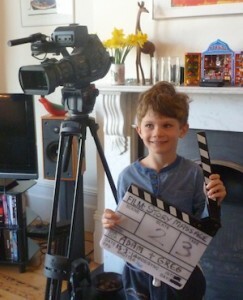 And what an amazing production team too! We’re sure you’ll agree reviewers who have written to say that Adam Parker and Gregory Jones (below) have produced a really valuable resource for sharing Story Massage at home, work or in the wider community.